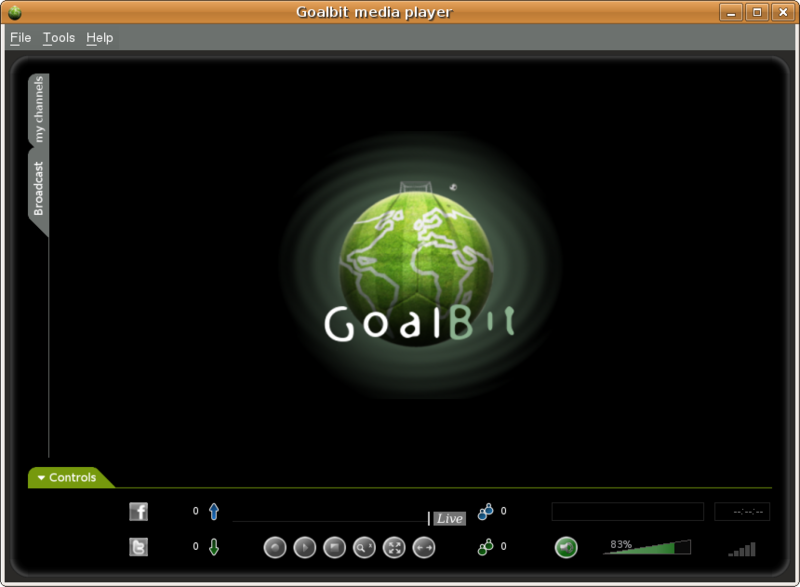 GoalBit Media Player desktop edition (1). GoalBit Media Player desktop edition (2). GoalBit Media Player desktop edition (3). GoalBit Media Player desktop edition (4). 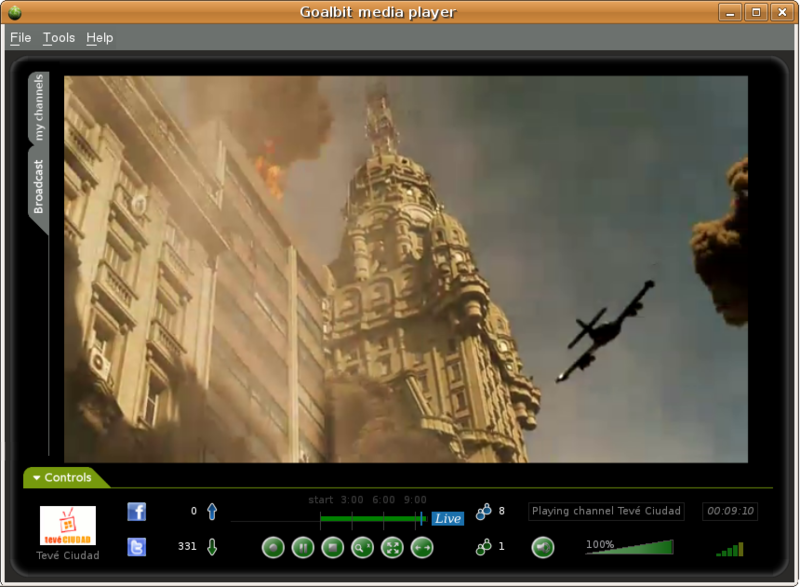 GoalBit Media Player webplugin edition (1). GoalBit Media Player webplugin edition (2). 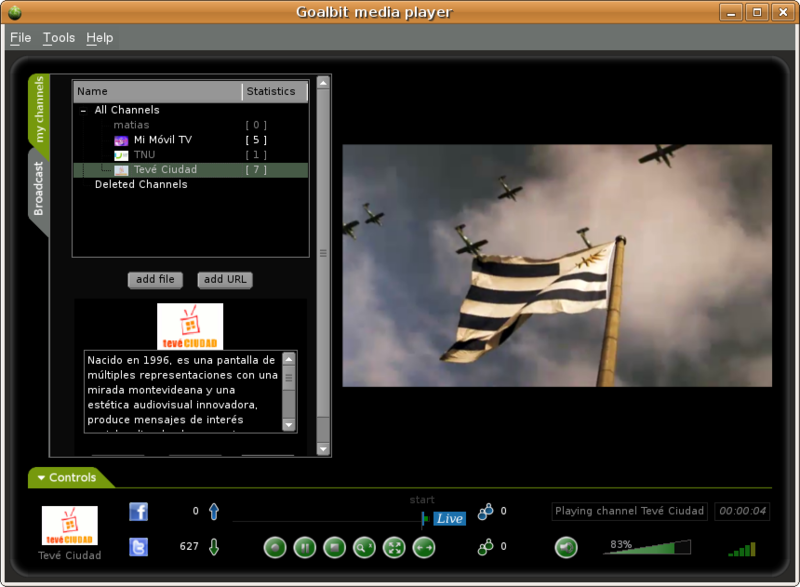 The Goalbit media player, is free software based on the VLC media player and is, therefore, released under the GNU General Public	License. It mainly provides the capability of streaming in the P2P Goalbit protocol, a protocol based on BitTorrent. Play and record GoalBit video streams. This binary contains the desktop edition, including the webplugins. You can check here the VirusTotal report. This binary only contains the webplugins edition. You can check here the VirusTotal report. 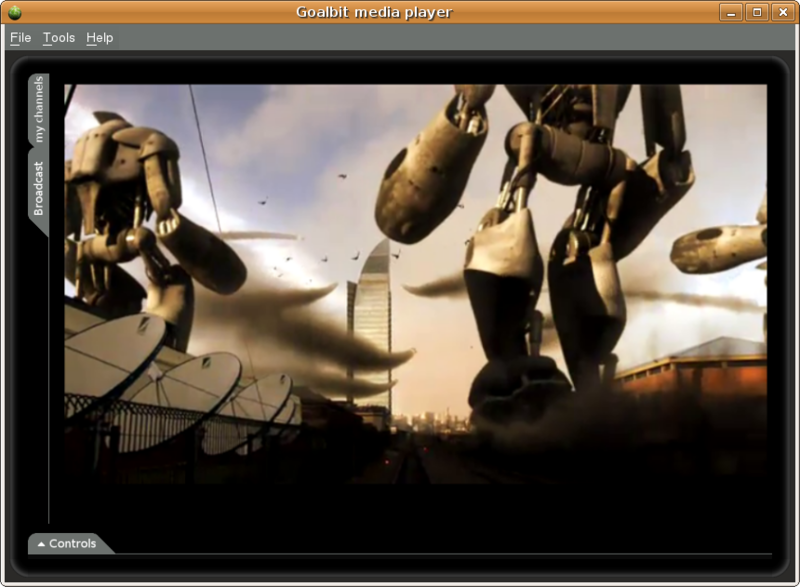 Learn how to compile the GoalBit Media Player for Linux and Windows here. Notice: Some Antivirus software have been detecting several releases of VLC and GoalBit containing virus. This is a false positive for any of the cases. We have personally contacted every Antivirus software and reported this issue, and therefore reducing the false positives from 16 to 4. We are still working for reducing them to zero, but some Antivirus companies don't provide false positive reporting methods, or have to be reported of each new Goalbit version. Read VLC's forum about it. Manage available channels (video streamings). Web broadcast. 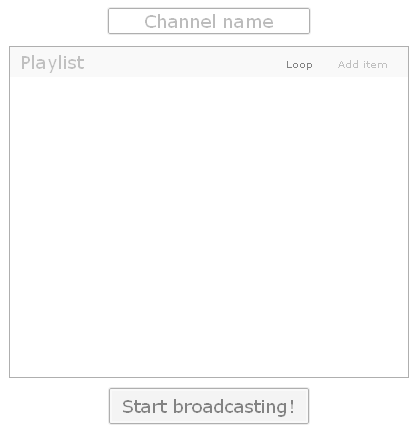 That is, through a web you can select the video source and create a channel, ready to be shared. The Web Plugin is required for this! Starter Suite is currently at version 0.1.1. Learn how to install and use the GoalBit Starter Suite here. GoalBit Services Manager broadcaster's configuration (1). 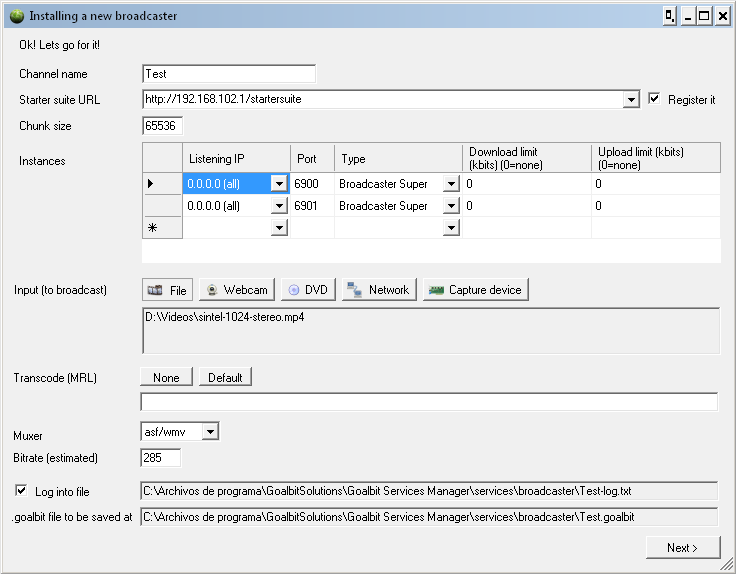 GoalBit Services Manager broadcaster's configuration (2). GoalBit Services Manager super-peer's configuration (1). GoalBit Services Manager super-peer's configuration (2). 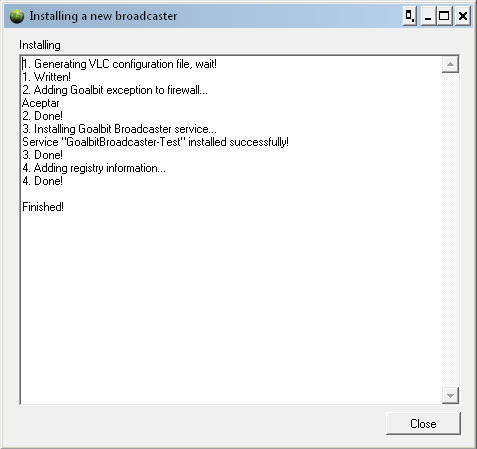 The GoalBit Services Manager is a Windows executable with a graphical interface that allows to easily create and run GoalBit broadcasters and super-peers, as Windows services (processes in the background). The GoalBit Services Manager is currently at version 0.2.2. Learn how to install and use the GoalBit Starter Suite here. You can check here the VirusTotal report. Learn how to deploy and use all these applications together.